Almost every lady that I know would love some more curl to their lashes. So we all go out and look at eyelash curlers. And WOW! There are a ton of different choices! So how do you know what will work for you? Well I recently tried out the new Beauty Lashious Eyelash Curler and I can tell you it’s not like any other curler I have ever used. The buggiest difference is the handle. I love how there are grips for you rather than a little circle handle. 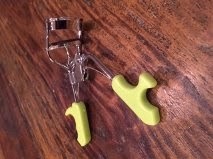 My fingers always get caught up in other eyelash curler handles. And in the morning I don’t have much time. So it becomes frustrating when I am trying to get ready and I have a eyelash curler stuck on my hand. That will never happen with the Beauty Lashious Eyelash Curler. It’s not the traditional handle. I don’t know how to explain so I’ll show you. See how the handle is not like any other curler? It makes it real easy to hold with only 3 fingers also giving you more control. The curler give a beautiful curl to your lashes opening them up. I like a nice curl because I have seasonal allergies and if I can keep my eyelashes out of my eyes then I seem to have less irritation. This curler gives a swoop curl that looks natural and opens up my eyes to help showcase my baby blues. If you are loving what you have read so far head over here to purchase your own. I received Beauty Lashious Eyelash Curler complimentary for evaluation purposes. Regardless, all opinions expressed are still 100% my own. I am disclosing this in accordance with Federal Trade Commission 16 CFR, Part 255 Guides Concerning the Use of Endorsement and Testimonials in Advertising.